Since my last bullet journal post, I’ve actually changed quite a bit about my bullet journal. For one, look how pretty my little bookshelf page looks now! As I read more and color in the books, it’s so fun to see the page get more and more colorful. I’ve also had to jam more books on some of those shelves – I may run out of room by the end of the year at this rate! 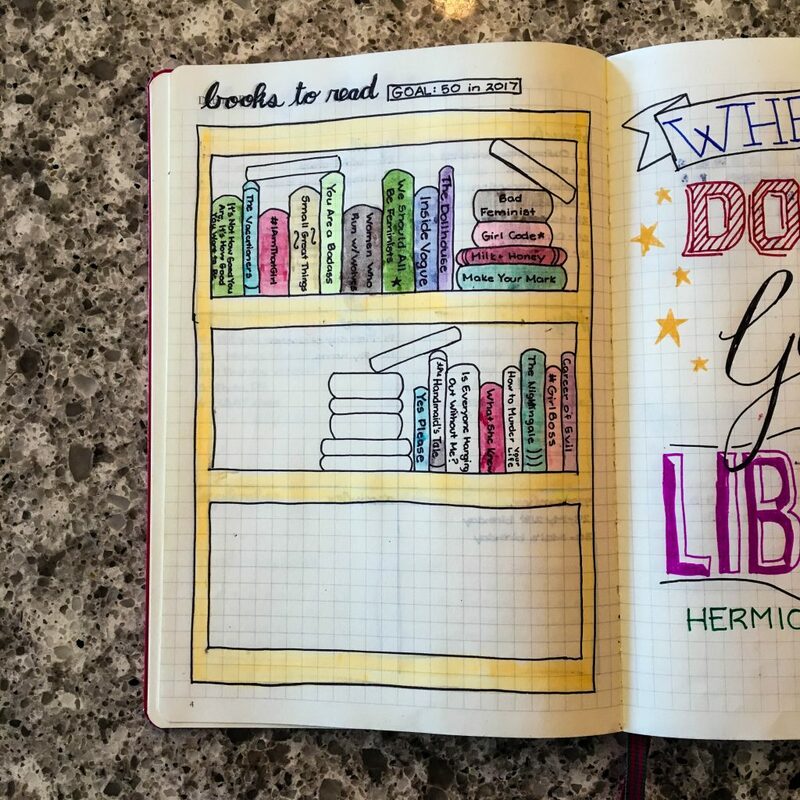 One of the greatest things about bullet journaling is its customization. If you don’t like the specific arrangement of things, you can change it up! 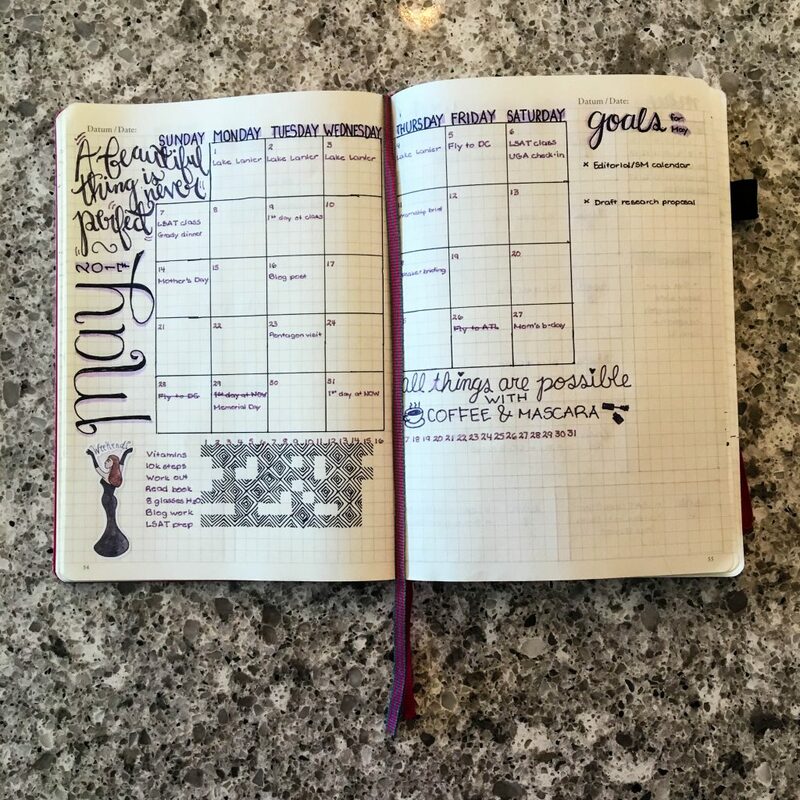 A normal planner doesn’t offer that level of flexibility, which is one thing I always struggled with when using other pre-made planners. 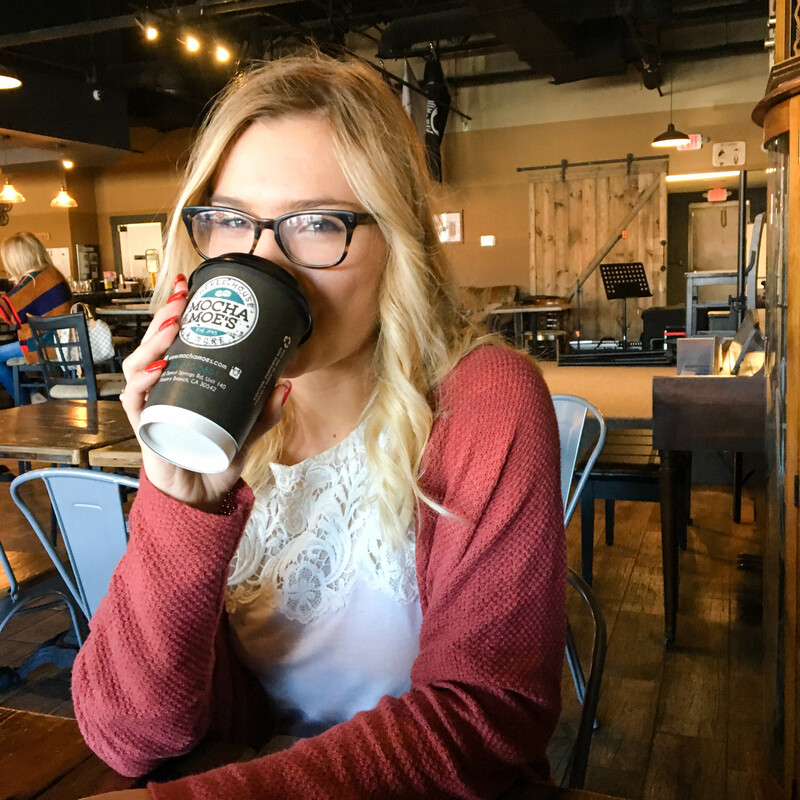 I like tracking random things, like my water consumption and blog post ideas, so being able to dedicate pieces of my bullet journal to things like that is awesome. With that being said, I did miss the structural element of a monthly display in a traditional planner. At the beginning of the year, I kept my months on a list format, and while that was nice and easy to make, it didn’t have the same effect and made it harder to keep track of days of the week. So, I switched to a more calendar-like monthly view back in March! It took a little tweaking to get in how I wanted it, but I’m really happy with the way that May turned out. Speaking of May, this month was also when I implemented a new weekly/daily layout as well. Previously, I was kind of listing days as the happened and adding to-do lists and daily events below, which was nice in that it allowed me to take up as much space as I wanted for tasks. 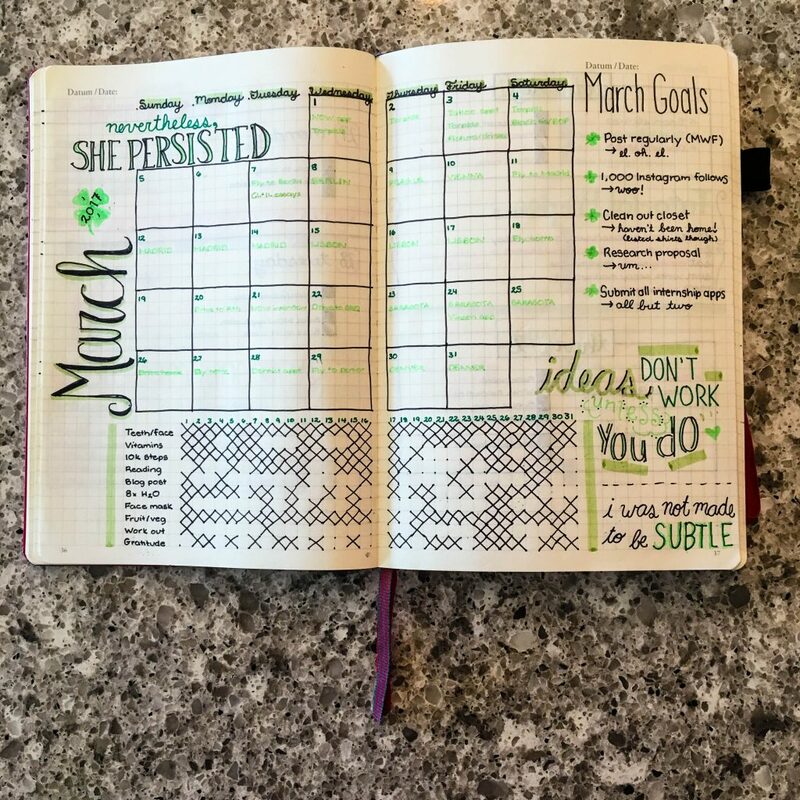 However, once again, I missed that clean look of a weekly planner page. 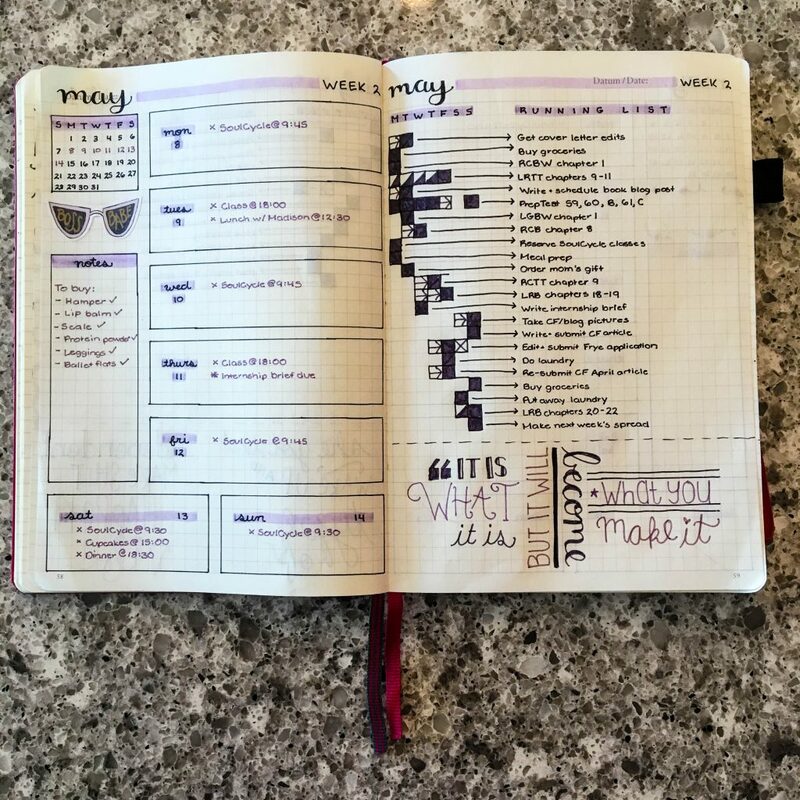 Therefore, my bullet journal now has a clearer weekly view on the left, and I’m able to keep a running list of tasks on the right page – the best of both worlds, really. 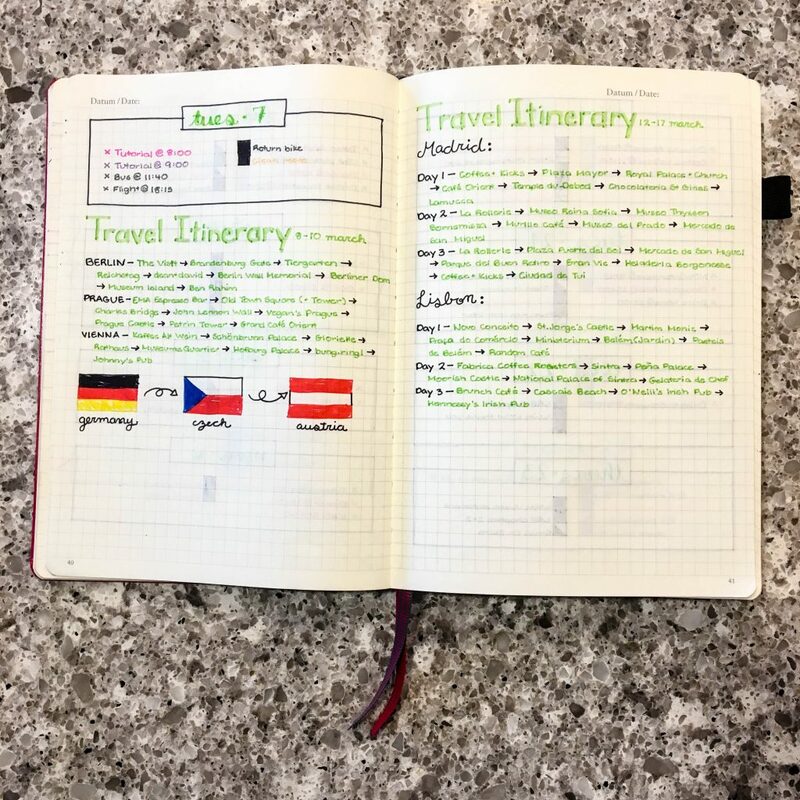 Also, for a fun page, I tracked my travels in Berlin/Prague/Vienna/Madrid/Lisbon on these pages so that I wouldn’t forget all the places I went (this was one part sentimental and one part practical, because I knew I’d be writing blog posts about them in the future). If you’re wondering what tools I use for my bullet journal, I use this notebook, these highlighters, and these pens. Any other bullet journal lovers out there? Any cool page ideas I should start using? Let me know in the comments!